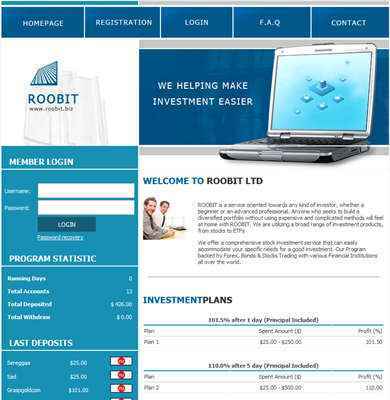 ROOBIT is a service oriented towards any kind of investor, whether a beginner or an advanced professional. Anyone who seeks to build a diversified portfolio without using expensive and complicated methods will feel at home with ROOBIT. We are utilizing a broad range of investment products, from stocks to ETFs We offer a comprehensive stock investment service that can easily accommodate your specific needs for a good investment. Our Program backed by Forex, Bonds & Stocks Trading with various Financial Institutions all over the world. Jan 29th, 2019 07:46 AM Scam! No payments! Jan 29th, 2019 06:37 AM СКАМ! фейковые выплаты!!! Jan 7th, 2019 10:18 AM This admin is a scammer ! !